Today is May 25th. Already. That means that in 36 days (did I count that right? ), this year will be halfway over. And I find that in the last months, I’ve fallen back into my bad habit of leaving projects half-finished and moving on to something else. It’s a personality thing. I don’t know if it’s because I have a short attention span, or if it’s because I have about a million ideas swimming around in my head, so as soon as I see that an idea is going to work (or isn’t going to work, as the case may be), I’m ready to move on and try out the next idea. But whatever the cause, this is something I’ve done for as long as I can remember. It’s my default setting. I can change that default and be a person who actually finishes a project before moving on to something else, but it takes an awful lot of self-discipline for that to happen. And lately, that self-discipline seems to have gone by the wayside. So today, I’m taking account of the half-finished projects that I have around my house, and I’m going to do my best to finish them in the next five weeks. I’d like to start the second half of this year with a clean slate without any half-finished projects hanging over my head. For example, my music room walls still aren’t finished. I did the stencil on the walls last June. I did all of the big parts, but I failed to complete the tricky parts around the doors. 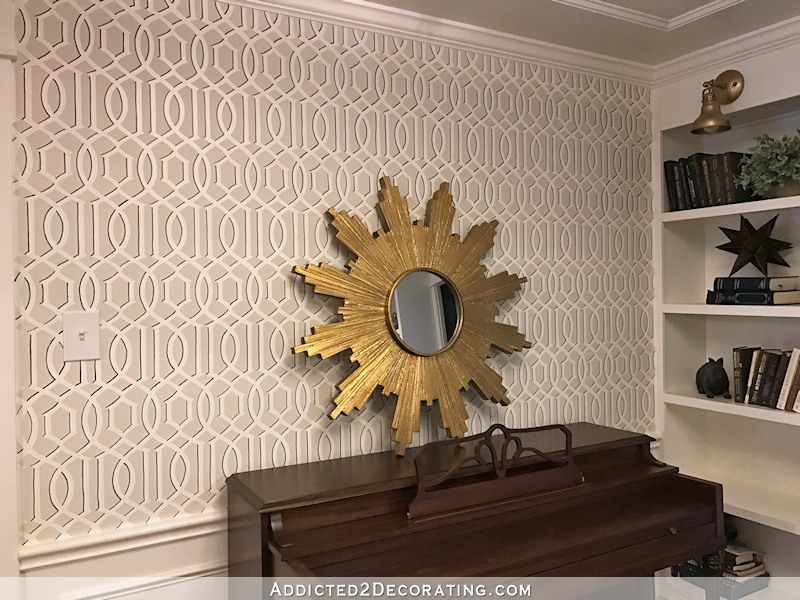 And then in January, I decided that the stenciled design needed a bit of oomph, so I finished up the tricky parts of the stencil on one side of the room and then added some detail with a Sharpie marker. I got one wall finished, and then decided, “Yep, this Sharpie marker on a stencil idea is great! It totally works!” And with that, I was ready to put a my green “it works!” check mark by that idea, and move on to the next idea. So now I need to go back and actually finish the walls. Then there’s the entryway. I’ve tested out some paint colors, both on the frame around the grasscloth as well as on the credenza. I actually did go ahead and paint the frame around the grasscloth teal. It looks awful, so it needs to be white. Oh well. I had an idea, I tried it out, and it didn’t work. No big deal because it’s just paint, but I do need to get it done so I can stop looking at that awful teal frame. 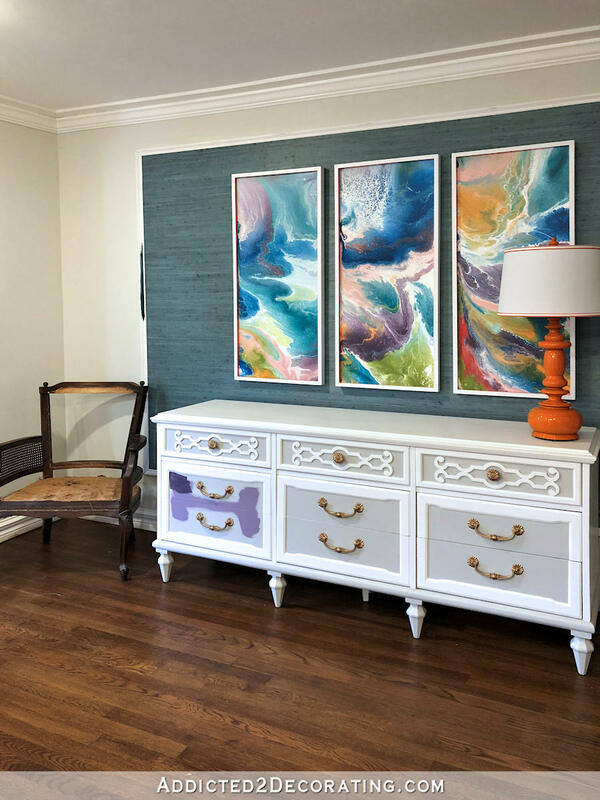 And I need to make a decision on the credenza so that paint test colors aren’t the first thing a person sees of the inside of my house when they stand at the front door. Next up, living room draperies. I got one panel finished, and that’s it. I’d like to at least get the drapery panel for the other side of the fireplace finished. The double-width panels for the front windows can possibly wait until my studio (with the big workroom table) is usable. But for now, I’m so close to getting that second panel for the fireplace wall finished, so I’d like to at least do that. On the exterior, I need to finish my shutters. I got the shutters made and installed on the studio. 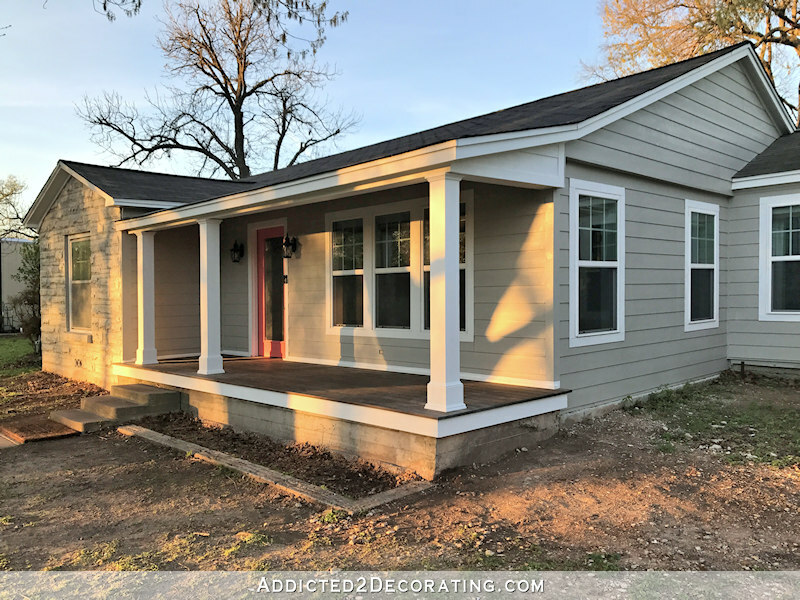 You can click here to see how I made them, and click here to see more pics of the shutters installed. But I still have two more windows on the other end of the house that need shutters. 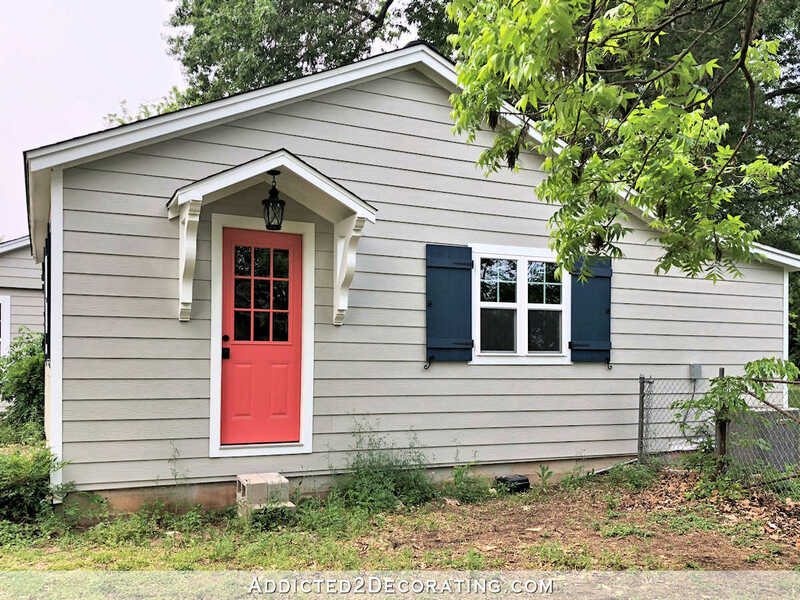 I think shutters on those windows will not only add some much needed color to that end of the house, but will also balance out what’s going on on the studio. But I’ll admit that this as just a matter of pure procrastination and avoiding a project that I’ve built up in my mind to be incredibly challenging and frustrating. Generally when I build a project up like that in my mind, and anticipate the worst, it turns out to be much easier than I expected. But I really think this one will be every bit as frustrating as I’ve imagined it will be. Putting shutters on siding is pretty easy. Putting shutters on stone that is really rough and non-uniform on the fronts, with up to three inches of depth variation on the front of those stones, is going to be a real pain. I imagine that it’s going to require quite a bit of careful chiseling in order to get the front of those stones smoother so that shutters can actually sit relatively flat against them. I’m not looking forward to it, but I do want it done. …so it’s kind of a let down to actually step onto the front porch and see unfinished rafters, insulation, wiring, etc. So those are my half-finished projects that I’d like to get done by the end of June so that I can start the second half of this year with a clean slate. You’ll notice that I didn’t add anything about the studio because right now I’m just waiting to see how the carport project progresses. But if things go according to plan, it’s very possible that by the end of next week, I could be adding “finish wiring the studio, half bath and mudroom” to this list. We’ll see how it goes. 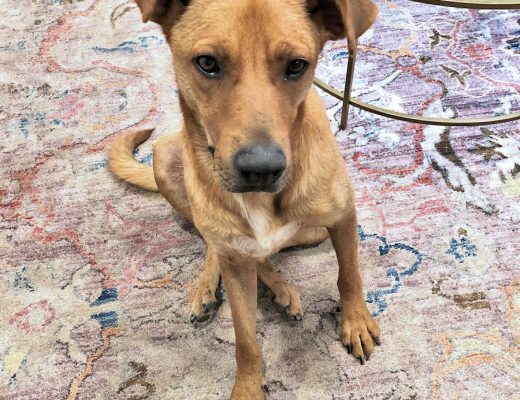 I know for a fact (because y’all have told me) that some of you are also dealing with unfinished projects around the house that you just can’t seem to get motivated to finish. Join me on my challenge! Let’s get these finished so they’re not weighing on our shoulders when we cross that line into the second half of 2018!! Next Post Carport Progress: We Have A Ramp! So happy to hear the carport pour is happening. Good for you for tackling the unfinished projects. I’ve been trying to get those done outside and it’s happening, but slowly, especially since summer seems to have arrived early this year. So exciting about the slab! It’s great that you were able to get that project underway so quickly. And, I agree. Hold off doing anything in the studio until that back wall is reframed and brought up to 8′. I’m with you. I have some unfinished projects I need to tackle. I love a long weekend, and it’s going to be rainy here, so maybe my interior projects will get a dent in them. Here’s to both of us getting it done! For your shutter over the stone, what about applying a thin board to the window frame and then applying the shutters to the board? Probably only someone walking right up to them could tell. Or use a grinder to smooth out the area. Do you have anyone nearby that could be your “accountability coach”? This works for some of my clients that have trouble finishing their “homework” when we’re organizing their home. Just a thought…. Challenge accepted! The colors have been selected for the dining room, living room, and the bathroom. I just need to paint them! And I only primed the bathroom vanity. I’m going to stop listing the half finished projects now! Good luck to you in your goal! Such a simple axiom, but it has literally been a lightbulb moment for both my sister and me. Now, I am trying to be aware of those things that arouse dread in me, and pursue them so that I can really prove the wisdom of the axiom. What’s amazing is that nothing is ever, EVER, as bad as I think it will be, and frequently ends up being actual fun. Shims and spacers for the shutter in the stone. That sound much better than chiseling it! I’m trying to finish a bath refresh including new vanity. Guh, plumbing. Also have interior doors/jambs to change out. Which I know is going to lead to repainting trim and possibly the hall. I better get to it! LOL Kristi. I hear ya with the unfinished projects. I don’t call myself the Queen of Procrastination for nothing. On the topic of your shutters on the stone part of the house – instead of chiselling stone – which strikes me as a huge pain – why don’t you attach a support top and bottom that is thick enough to act as a sort of shim and attach the shutters to that allowing the shutters to just clear the stone entirely? You still have a whole month, plus the rest of May, before the year is 1/2 over. Bonus!!! Doesn’t seem like so much until you write it out. 😀 Ah well, if I do all of this, my work/craft/storage room will be all cleared out… so here’s to June! 😉 We all know you can do it, Kristi! I know you like to complete your projects but there is no shame in your game. You’ve accomplished more in the last year than I have in this house for the last five! Chiseling stone, though…Whew! Onward! Have you ever thought about installing the shutters at a slight angle away from the house? They would appear to be functioning shutters and you could use wedge shaped blocks behind the shutters to hold them at the angle you choose. Would save the headache of trying to get them to lay flat. You can probably find an example on Pinterest or Houzz. I’ve seen it done before and I think it adds a neat dimension to a house. Just an idea. 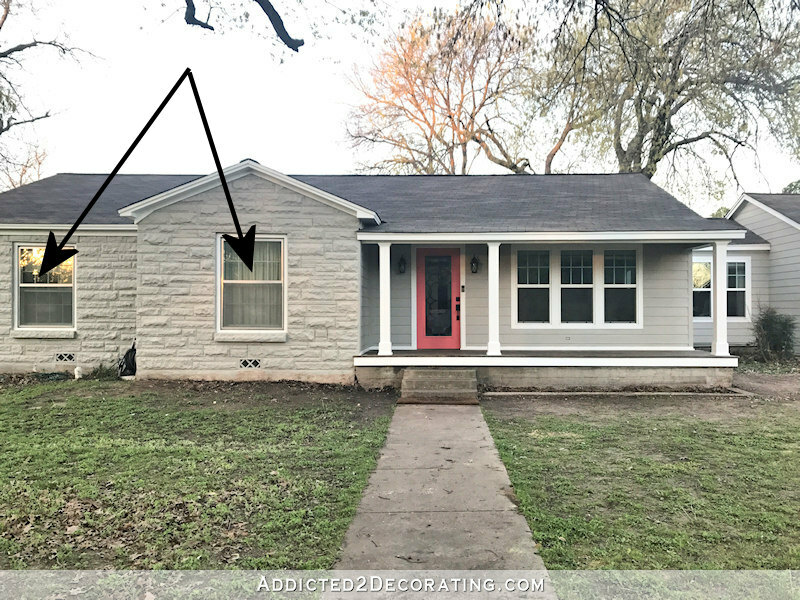 Regarding your shutters for the left hand windows (the ones on the Austin stone): Do I remember correctly that these are old windows that you plan to replace? If so, I think you will want to wait until that is done before mounting your shutters. 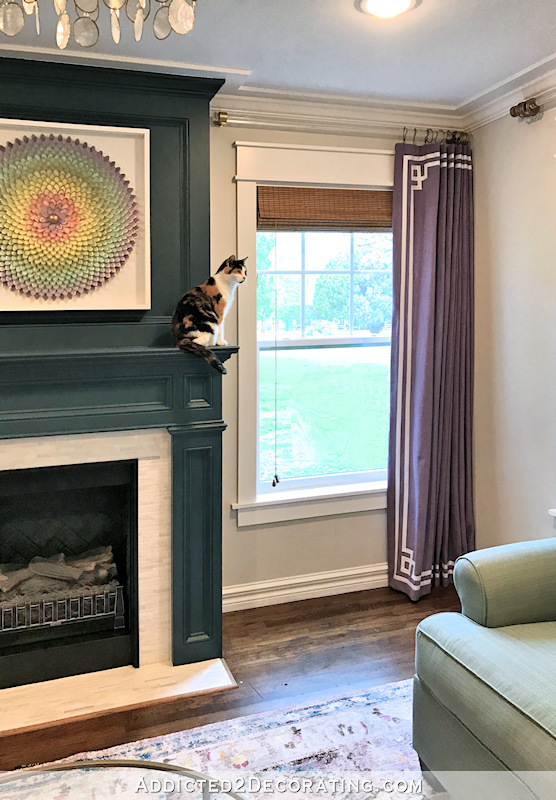 But since you know the size of those windows and the exterior trim that go with them, you can certainly go ahead and make and paint them now. I also urge you to fir out the window side jams to allow you to mount those shutters. Chipping away at the Austin stone is something you would live to regret, as at some time in the distant future, you may decide to remove the shutters ( I know, very unlikely). And the mounting on the jams instead of the stone will be much easier. You will, of course, need to drill into the stone for the shutter dogs, but so much easier to do! It may even be easiest on these windows to actually mount the shutters on working hinges, drilled into the window trim. And don’t ever berate yourself for not finishing your projects. Your list of finished projects is prodigious, and your unfinished ones are so far along! You DO finish your projects. You just tune them up later (like the molding on the grass cloth). Fine. You do know that houses are never really finished anyway, and that’s the fun part. Wish I’d read Christine’s comment before I commented, I think this is great! And yes, I will be replacing the windows, hopefully later this year. But they’ll have to be a very precise size so that the proper sized trim and the window can all fit inside the cut opening in the stone. There’s not any room for variance there, so I think I’m okay going ahead and making the shutters and hanging them. About the shutters on the stone, first I want to say it will be so charming to see B & B shutters on the stone like that and I’m glad you kept and painted the stone. Could there be a role for shims in getting them to hang straight and level? Or some some kind of sacrifice board to which you ultimately attach the shutter? If you were inclined to hire this out, I would support you (although it’s not my money lol) but you’d have to hire it out to a perfectionist who would give it all the thought and care you would. I have a contractor/carpenter like that but he lives in GA. I could have written a twin for this blog post. I’m currently trying a new strategy to get me going, because I love love love the lure of a new challenge, but I’m bored with something I know I can finish but lack the self discipline to tackle. At the start of the week I put myself onto a new planner discipline with daily goals and weekly checklists. So far I can make myself follow through. And I am making starting a new short project I’ve been wanting to try contingent upon completing the week’s goals sheets. Somehow the writing and the ticking off is helping. I see concrete progress. But who knows how long this will last? I so agree this is a personality issue. I want to see if I am able to do the project, not to see it completed. Sheesh! Thank you Kristi! Thank you for the great idea of finishing the half-finished project challenge. Setting it up as a challenge is very appealing to me. I very much understand and empathize with you on this issue. So – I’m with you! Let’s go! Your reasoning is realistic so you clearly see what there is to do. You have inside and outside jobs. First, the outside: If rain is in the forecast, weather is a factor. Temperature too? Hmmm, what good advice here on hanging the shutters! Chiseling stone sounded like a horrible prospect. Doing one of the suggested ways should be easy for you. Inside: the sharpie job. Good result to come. A bit boring to do. Estimation of time? Listen to an audio book, or music, or to Matt regaling you with something witty. The white paint around the grasscloth. Easy peasy and fast. Above the credenza: my take is that your artwork sings and wins the Grammy, and the orange lamp pleasantly surprises with its perkiness. The credenza already has a busy personality because of its details. As to color: I hope not two-toned, which would detract from what you have achieved above it. Busyness jangles. And, not the dark purple since the grasscloth already is darkish. The lighter purple? It would quiet things down and still be interesting. Better than all white, but if white is in the game, how about spreading a white sheet over the whole piece with the lamp in place and mull for a day or two? 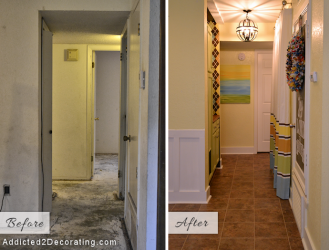 Let your house projects entertain you as the process continues. You aren’t in a race. You do finish things, just not in sequence. That is not a character flaw; it is a feature of your charming personality. So, is your honesty in voicing how you feel. As for me, I keep a list of creative projects and if they are not urgent, I pick one to do according to my mood gauge. Some days I welcome boring. Other days, no. In either case, the vision of the end result is the motivation that pulls me forward. I don’t react well to self-imposed pushing. I won’t allow it from anyone else. But pulling works just fine, as long as it isn’t my teeth. Thank you so much from Upstate NY. I have never been a procrastinator. I have always dove in and did what had to be done to finish the job, until this year. All of a sudden I am not finishing anything. Things that are VERY important to me are not getting finished. So here we go, with your push, I am making a list and diving into these next few weeks with gusto!!!! Again, thank you for the push. 1. 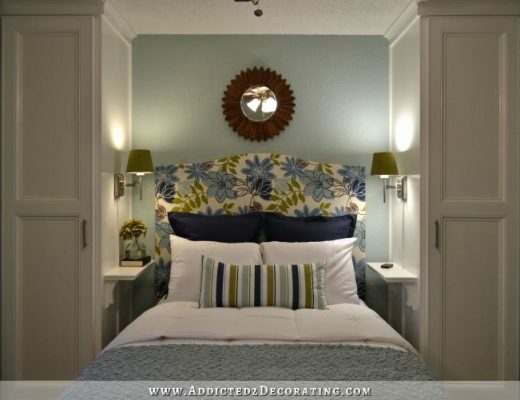 Paint the master bedroom again for the fourth time (don’t ask, lol), install and paint new baseboards, door and window trim and dress the room. Thinking about a coffered ceiling in the master bedroom, but not sure yet. 2. Install a new floor in the sink base cabinet. 3, Finish installing the laminate floor in my home office and add baseboards and trim around the doors and window. A pull down spice rack to install and to get stuff moved into. A cabinet overhaul on the lower cabinets with pull outs and racks. 2 bookcases and a shelf between them for my office and lastly all my pictures I schlepped from my old house in Feb 2015 🙀 need to be removed from their frames, scanned and either mailed to the kids or put away. Plus: Putting in my wheelchair lift this fall to finish making this place WC friendly! I bet Matt is excited to get the carport done! Well, it isn’t one or two unfinished projects for me. It’s everything about everything about everything, from closets to storage sheds to… It’s overwhelming. I make a pledge to join you in finishing “some stuff.” Not sure what stuff, but stuff. You aren’t alone, and I think you’re an inspiration! Challenge accepted! I have tons of excuses, some of them are even good excuses. 😉 Making a list now, lets all check in on June 30th. I’m the opposite…can’t stand to have any unfinished projects and rarely start anything new until I complete what I’m working on. I think that’s why in my head I often scream at you! My brain doesn’t work like that. Yes! My thoughts too! Or gold to tie into the coffee table. You are the most honest and hard working DIY blogger I know. Kudos to you for sharing your heart in this post. I know you will get all of your projects finished and I want to encourage you to hang in there. You know we are all cheering you on! Honestly, I was super encouraged by this post because I still have a to-do list for the living room refresh. I’m so so so close, but when I realized I had to reupholster yet another chair (remember …I bought the pneumatic stapler? ), my heart sank. When will I EVER be done with that room??? Now, I kinda feel energized to finish that second chair!! Today, I’ll get the lights hung and I’ll make that the first cross-off of the finish list. Tomorrow…the chair gets started!!!! I look forward to hearing how you wrangle your to-do list and get your cross-off list underway!! I absolutely LOVE those drapery panels. I’m so anxious to see the next photo (full-frame) of both windows and the fireplace!! So excited for you!!! It will look sooooo good. Remember girl, you got this. Not only do you have this, you deserve to have this. Consider Benjamin Moore’s Tulsa Twilight, a deep purplish black, or similar for the the credenza. I would paint the whole thing one color. From the first time I read your blog I wondered if you are a Gemini? I am and I work exactly like you and felt like we are kindred spirits! Many of the Gemini women I know are the same way. We are highly creative and always changing our minds so it’s difficult to finish one project before starting the next. I will be moving in two weeks and have so many ideas for my new home but I am going to follow your lead for the rest of the year and try to start and complete 1 project at a time. You are a true inspiration for so many just by tackling projects that so many of us find daunting! Hi. I’ve never commented before but I had to just say thank you for this post! I have such a hard time finishing projects. I get started and about halfway through I don’t finish it up. I have soo many unfinished projects and this drives my husband crazy (though he’s actually pretty nice about it). It just feels good to hear that you aren’t alone sometimes. Seriously, it makes me feel like a loser but you’re certainly NOT a loser so this helps me to be gracious with myself :). I will come up with a list of some things to finish up for the next month (or maybe the summer). We can do it! Hello! 👋🏻 I just wanted to comment on your “shutters on stone” issue. I have an old brick house and every time I need to do anything to the exterior I have hired a mason to do the prep work. I have always found it to be very affordable. Since they have the tools and experience they can probably come smooth those areas in an hour or so. If you have a mason around give them a jingle!